With the trip being a family weekend we tried to get away on the Saturday and join Dave, Joel & Brooke, Col, Paul, Len and Trent up at Liddell but life got in the way and we had to settle for an early departure on Sunday morning. So at 5.15am the Bannerman family headed up the freeway to Singleton. It looked like it was going to be a great day with a pink morning sky but clear to the northwest where we were heading. Arriving at the golden arches just before seven we were soon joined by Bob and Dave De Luca and Murray and his son Josh who had camped at Lake St Clair the night before. Over breakfast Murray related Josh's fishing adventures the previous evening with a big bass lost being the main feature. With no one else arriving we all set off up the New England Highway turning off to Liddell about 20 minutes later. Pulling up at one of the picnic tables we found Sticker had arrived a little earlier (forgoing MacDonalds - he's watching his figure these days) and was rigging up along with Col who was still cooking brekky. 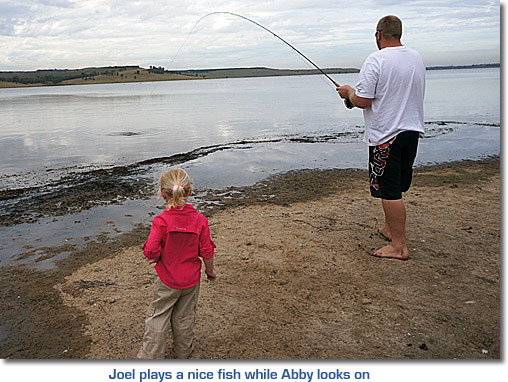 Brooke and Joel were also there with their little one, Abby. 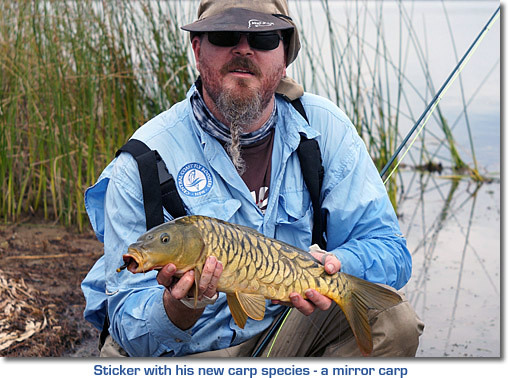 The rest were already out on the water chasing the carp from their boats. Bob and Dave D, and Col soon joined them while Sticker headed around to the bay near the road. 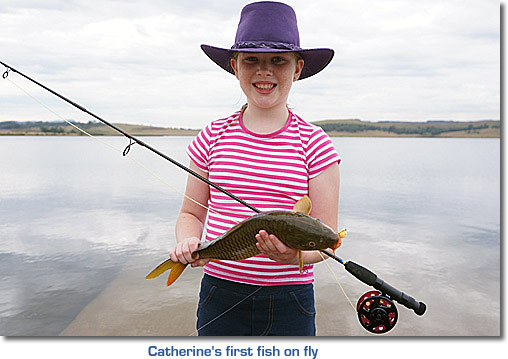 Catherine was keen to get started so I rigged her rod with a corn fly and armed with a tin of corn we headed off to the boat ramp where it was easy to fish. We were soon joined by Murray and Josh as well as Brooke, Abby and Joel. I threw a few handfuls of corn out while Catherine practised her casting then helped her cast a bit further out where we'd seen a fish swirl. No sooner had I turned my back than I heard a "Dad, I think I have a fish" and sure enough she was on, rod bent over. Her first fish hooked on a fly (on anything in fact). Luckily it wasn't a monster and we soon had it beached on the boat ramp. Needless to say I was a pretty proud dad at that moment. We continued there for a little while but nothing seemed to be around so we headed over in Sticker's direction to my favourite haunts - the small bay near the road and beyond. Sticker was busily casting to fish he had sighted in the shallows at the head of the bay while we fished half way down, Catherine with her corn fly and me with the traditional egg-sucking leech. It was blind casting as the water was quite murky and grey clouds prevented decent sight fishing. Luckily for me though I hooked a reasonable fish before we again chose to move on. 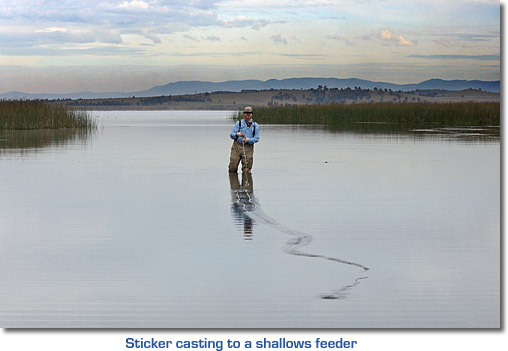 Crossing the fence and heading around to the next couple of bays we soon spotted fish in the shallows. I fired out a quick cast near them and was met with a tight line on the second strip. Bow waves went everywhere as the fish panicked and spooked others but I eventually landed it after much slipping around in the mud. Soon we spotted a school of fish 50m further on. They seemed to be chasing shrimp as we could see something jumping out of the water ahead of them. We quickly moved to casting distance (which involved wading out knee deep in water - knew I should have brought waders) and put in a cast to see if we could hook one. No sooner had I started stripping than I was on and another solid carp was landed. 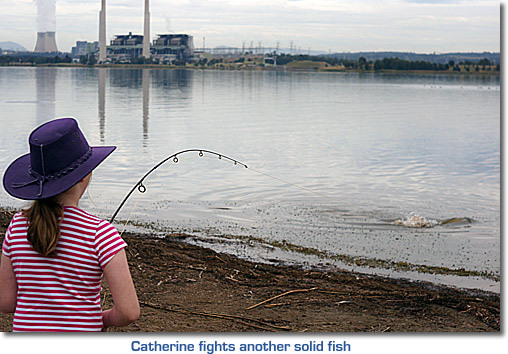 Next it was Catherine's turn. We changed flies to a red and yellow chenille woolly bugger and helping her to cast she also hooked up on a solid fish and backed out of the water to land it a few minutes later. She was pretty pleased with herself as this was a decent sized fish. Sticker soon joined us and we were both casting to schooling fish with many swimming around us before being spooked by our movements. The fish were eager to take the fly and we enjoyed a good session there with two more each taken by Catherine, Sticker and myself before heading back to set up for lunch. On our way back the Bunneys arrived and headed out for a quick fish before returning for our BBQ lunch with everyone else. 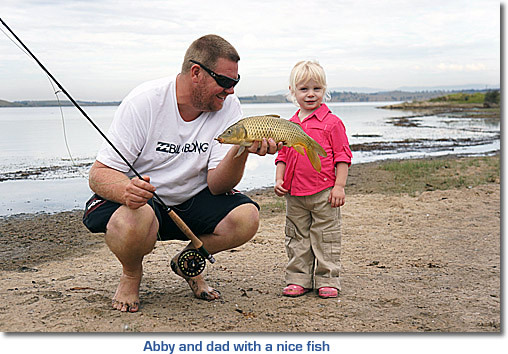 All reports were that just about everyone caught fish including the kids. We departed about 3pm leaving Col, the Bunneys and Stickerman to continue on while we took a leisurely drive back through the Hunter wineries. As usual with this trip, a fantastic day with plenty of fish and fun. I look forward to next time.